The undersea city of Atlanteon is under attack! Take command of an army of aquatic warriors, powerful wizards, and fantastic water beasts as you battle to control the capital of the deep. Send your forces to capture the Emperor's palace, Neptune's palace, and the Sea Hag's tower- but beware! If your king is captured, you'll lose the game. In the tradition of Kingdoms, Maginor, King's Gate, and Scarab Lords, Reiner Knizia continues his brilliant series of board games. 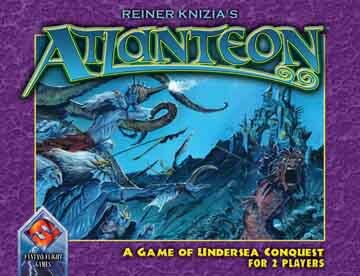 Atlanteon is a strategic two-player board game, playable in 20-60 minutes. Atlanteon may have an Atlantis theme, but is really an abstract game about placing your pieces in the best way in order to claim opponents pieces and fulfill one of 3 victory conditions. An abstract with no less than 3 victory conditions may sound overly compllicated, but actually it is refreshing and makes the game much less predetermined than other abstracts - which moves are the best is not always a given, since it will depend on which victory condition you are trying to fulfill.